Submitted photo Kenneth Petersen, the dean of the College of Business and Economics at Boise State University, will participate in two public forums on April 18. FAIRBORN — The first candidate for the position of executive vice president for academic affairs and provost of Wright State University will visit Wednesday, April 18, and Thursday, April 19. Kenneth Petersen has served as the dean of the College of Business and Economics at Boise State University since 2014. 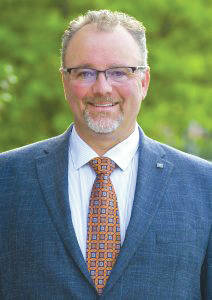 Prior to joining Boise State, he was the John H. “Red” Dove Endowed Professor of Supply Chain Management at the University of Tennessee in Knoxville. Previously, he served as professor and academic director of graduate programs in the College of Business Administration at Colorado State University; assistant professor of supply chain management and faculty research associate at Arizona State University; and assistant professor of decision sciences at the University of Oregon. From 2006 to 2015, he was a visiting senior fellow at the Manchester Business School in Manchester, England. From 1985 to 2002, he served in the U.S. Navy and the Navy Reserve in both the enlisted ranks as a sonar technician and as a submarine-qualified lieutenant commander in the Supply Corps. He has also consulted with many firms in the area of supply chain management. Peterson’s CV is available at wright.edu/provost-search/candidate-visits. Public forums for Petersen’s visit will be held Wednesday, April 18; the open vision forum is slated for 9:30 to 10:30 a.m., while the research forum will take place 10:45 to 11:45 a.m. in the 101 Neuroscience Engineering Collaboration Building on the Wright State campus. The forums will be streamed live at wright.edu/streaming and archived online for those who cannot attend in person. Lake Campus community members can watch the forum live in 177 Dwyer Hall. Supervisors and managers are encouraged to provide employees with the time to attend the forums as business conditions allow. Each candidate will also meet with President Cheryl B. Schrader, Provost Thomas Sudkamp, students, researchers, the President’s Leadership Team, Council of Deans, direct reports to the provost, community members, the Board of Trustees, the Provost Search Committee and representatives of the Faculty Senate and Staff Council. https://www.fairborndailyherald.com/wp-content/uploads/sites/50/2018/04/web1_kenneth-petersen-3-212×300.jpgSubmitted photo Kenneth Petersen, the dean of the College of Business and Economics at Boise State University, will participate in two public forums on April 18.